You use your arms for throwing, lifting, pushing and pulling. Having strong and well-toned arms are crucial for all these activities, and it is imperative that you build your arms with a highly focused workout program. Free weights are great for improving the target muscles. 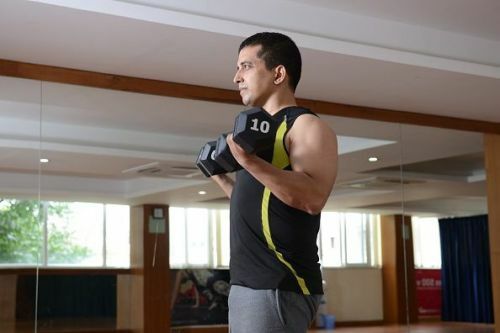 Particularly, the dumbbells are very effective as they activate a host of stabilization muscles ensuring you have a comprehensive workout that focuses on a wide range of muscle groups. Nevertheless, building strong and muscular arms needs time, and one should have enormous discipline and patience. Do not lift very heavy weights believing that it would give you quick results. It is counterproductive and could lead to a serious injury. Start with lighter loads and focus on achieving a higher rep count. Always keep in mind to complement dumbbell arm exercises with a multitude of other exercises for a complete body workout. Moreover, supplement them with a healthy diet that is rich in protein content, which is crucial for effective muscle building. Let us not wait any longer and look at the five best dumbbell exercises that you could add to your workout program for stronger arms. The hammer curl is one of the most effective upper arm exercises that you could perform using dumbbells. It tones the brachialis, biceps and the brachioradialis muscles for a complete upper arm workout. It could be performed by even beginners and casual trainers, thanks to its simple motion. Step 1: Stand straight and hold dumbbells in both the hands with the palms facing the body. The arms should be fully extended and parallel to the torso in the starting position. Step 2: With a stationary upper arm, move the weight upwards until it is in line with the shoulders. Achieve this movement by bending your elbows and contracting your biceps. Step 3: Hold the contraction for a moment and return to the initial position in a smooth motion. Important tips: Do use momentum to lower the weights as an improper form could lead to a shoulder injury. Moreover, do not make any unnecessary movements with the torso.